Dr Anne Smith as published a new Open Access article in the Scenario journal, entitled “You are contagious”: The Role of the Facilitator in Fostering Self-Efficacy in Learners. The article identifies kinaesthetic approaches to facilitating a learner in role, which help to lower the affective filter, and support learner progression in a mixed ability group. It examines the role the body plays in accelerating the creation of a supportive group dynamic, and where it can support and interfere with the likelihood of applying the language and confidence developed in real life. Dr Anne Smith has published an OpenAccess article in the ArtsPraxis journal, entitled “They have become my family”: Reciprocity and responsiveness in a volunteer-led program for refugees and migrants. Dr. Anne Smith has published an Open Access article in the latest issue of the SCENARIO journal of language, culture, and literature. This article argues that play and creativity are cornerstones of a person-centred approach to adult second language education. However, when learners are refugees, asylum seekers or migrants already living in the country where the language is spoken, it is important that language learning also addresses their functional needs. 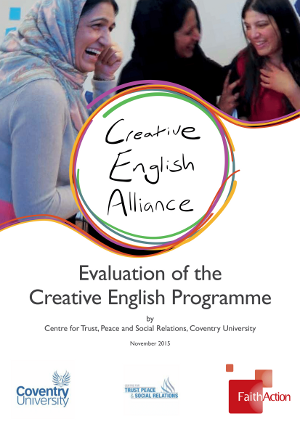 Creative English is an applied theatre programme for adults in the UK that balances these functional and creative needs while developing confidence in English language communication skills. 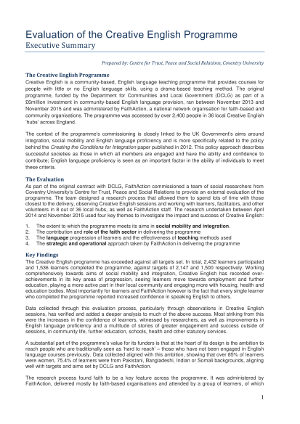 Drawing on participant-led, practice-based research which resulted in the development of Creative English, this article purports the benefits of an approach that combines playful emotional engagement with pragmatic subject matter. Creative English is based on improvisation. It reduces inhibitions and creates a state highly conducive to learning and taking the risk to communicate in a second language. It also offers the opportunity to rehearse language in everyday life situations. When learners’ perceived needs are met, Maslow’s hierarchy of needs can then be inverted, as creativity allows opportunity to address needs in terms of self-esteem and belonging. The paper, ‘Maximizing empowerment in applied theatre with refugees and migrants in the United Kingdom: Facilitation shaped by an ethic of care’ by FaithAction’s Dr. Anne Smith was published in The Journal of Arts & Communities, Volume 6, Issue 2-3. The paper draws on evidence from Creative English to argue for “the value of fostering an ethic of care within an arts project, which emphasizes the importance of facilitating a culture of agency rather than dependency for participants”.